WHAT: The distribution of poly(acrylic acid) in a microporous polypropylene support membrane has been measured quantitatively by Scanning Transmission X-ray Microscopy (STXM). 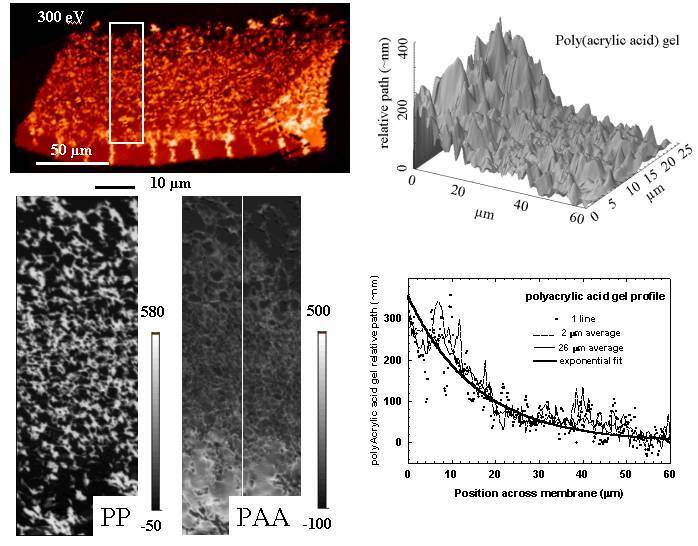 Singular value decomposition analysis of X-ray microscopy images recorded at carefully selected photon energies was used to obtain quantitative maps of the polypropylene membrane and the polyacrylic acid gel, the two components of this system. The sample was studied fully hydrated in order to perform the quantitative mapping when the membrane is in the same as in its state of application. Quantitative chemical mapping was performed by fitting images at 11 energies to reference spectra. 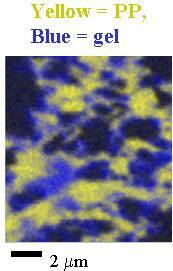 At high magnification the maps show the partially charged polyacrylate gel fully coats the membrane and thus controls filtraiton properties. STXM provides a useful tool to map the chemical components of structured multi-component polymeric systems, with particular advantages for systems were hydration (or other solvation) is an essential part of the system, as well as for systems sensitive to radiaiton damage. The present study illustrates both advantages.